Playful and smart, a coming-of-middle age story of a woman not ready to give up on love and life. He got the second home and the Porsche. She got the kids and a broken heart. Now Jackie, post-divorce and heading toward the big four-oh, is on vacation, staring down her upcoming birthday in sunny Hawaii—alone. But not for long. She’s soon falling for Kai, her gorgeous, much younger surf instructor, and the wild passionate fling they have becomes the biggest surprise of Jackie’s life. Returning home, Jackie has to struggle with single parenthood… and memories of Kai. He hasn’t forgotten her either. With her friends disapproving and thousands of ocean – not to mention an age difference – separating them, Jackie starts to wonder what she got herself into. When a choice must be made, can she, will she risk everything for her chance at happiness? I turn away, push wet bangs off my forehead as the hood on my coat doesn’t quite cover my face. I’m cold, tired, wet and grouchy and would give almost anything right now for a tall, non-fat, sugar-free vanilla latte. Or just a plain old cup of coffee would do. “I know what I said, but I’m not going to fight with you or your sister, not today. Getting the Christmas tree is supposed to be special. I want this to be fun, not a hassle.” Right. I look at William, my handsome first born who is thicker around the middle then he used to be, putting on size where I didn’t know size would go, and silently congratulate him on getting the job done. These days I’ll take all the help I can get. Reaching up I wipe my face dry again and think of the two umbrellas in my car that have been there for two years and never used. Odd to live in a place that rains so much and yet never use an umbrella. It’s just that most of us who live here don’t pull out umbrellas for something as insignificant as showers. We’re well…tough…tougher. I feel stupider right now, walking through wet mushy soil to stare at staked trees. We’re the only ones at the lot. Yes, it is a Monday at four in the afternoon, but surely there must be other parents who promised their kids they’d buy a tree today if they were good. If they were good, and glancing at my two, I see Jessica take a swing at William. Jessica with her blonde hair and blue eyes and great dimples at her mouth may look like an angel but is the devil incarnate. She’s hell on wheels and I wish I could blame it all on Daniel, but word has it I was difficult at five, too. “How about this one?” I say, pointing to a relatively attractive fir that’s in the five to six foot tall range. Both Jessica and William shake their heads. “It’s short,” Jessica says. He has a good point but I’ve seen the price tag. The tree is sixty-five dollars, twenty less than the better groomed brothers in the seven foot row. “We can put something special there,” I say. He hrmphs me, much like his father used to do, and then finds the tree we end up buying. While Jessica splashes in puddles in her best shoes (why didn’t I see she was wearing her best shoes earlier?) and then cries the whole way home that she’s cold. The good news is we have a tree tied to our roof and we’re in our car heading home. We’re home soon–I like step two, I feel really good about step two and congratulate myself for a job well done and now it’s time for three. The countdown is complete… In honor of Jane’s Hawaii-themed book, Flirting With Forty, she posts 40 FLIRTY THINGS you could be doing in Hawaii right now! Check out Jackie Laurens’ Favorite Luau Recipes as seen in Flirting With Forty. A 10-page PDF cookbook featuring recipes, photos from the Flirting With Forty movie set, and Jackie’s 40 Flirty Things To Do in Hawaii. 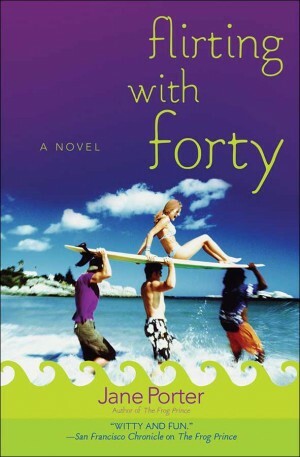 Download the cookbook for lots of Flirting With Forty fun!